Many gardens have at least one lavender bush, so why not dry your own flowers? 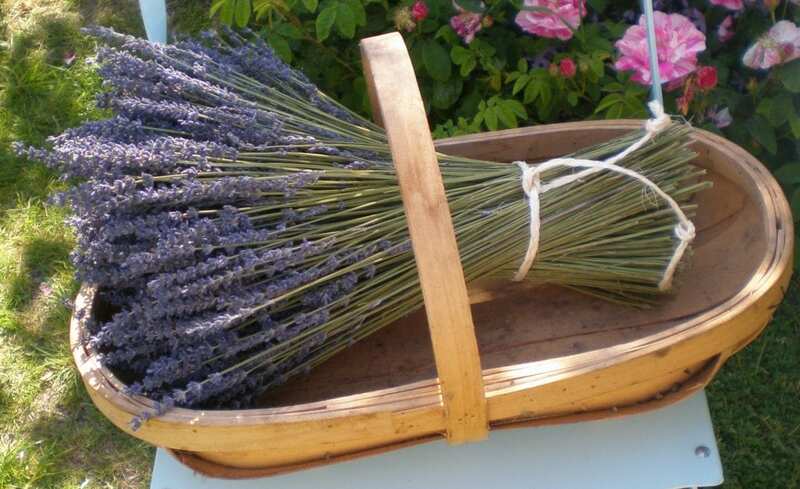 They will then last months indoors rather than a few weeks outside, and lavender has so many uses. 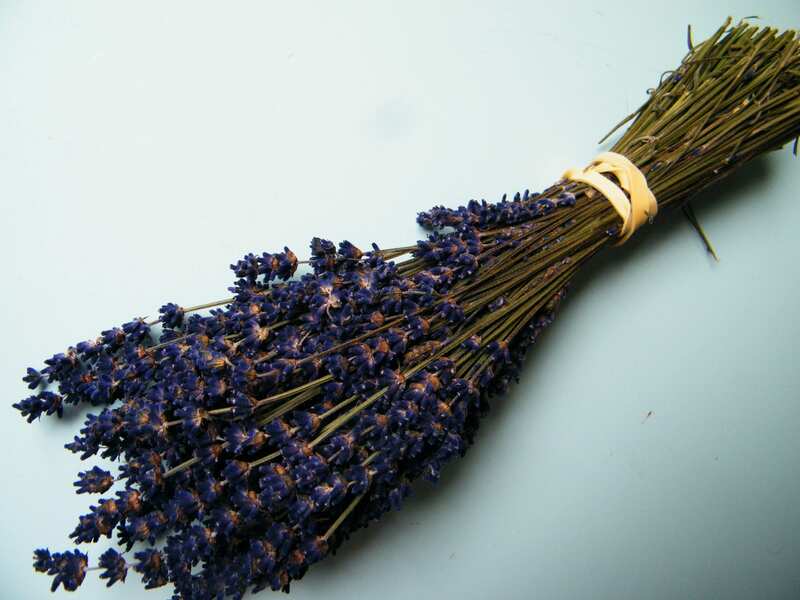 To get the most out of your dried lavender bunches it will help to understand a bit about the growing plants. As you can see in the photo below, there are many small purple florets on each flower head, and these are joined to the stem by the calyx, which is the tube-like structure. 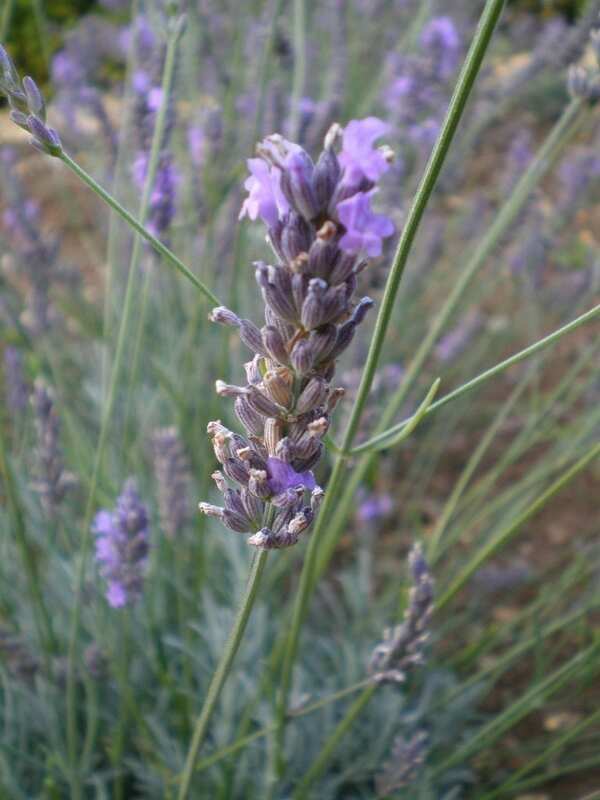 When you dry lavender, the individual florets fall away, leaving the calyx as the only coloured piece of the plant. You can see from this picture that although the florets are purple, the calyx is pale lavender grey – so the dried flower will be light lavender grey at best (bearing in mind that the colour may deteriorate slightly on drying). So it makes sense – if you have a choice – to go for plants with the most strongly coloured calyx. 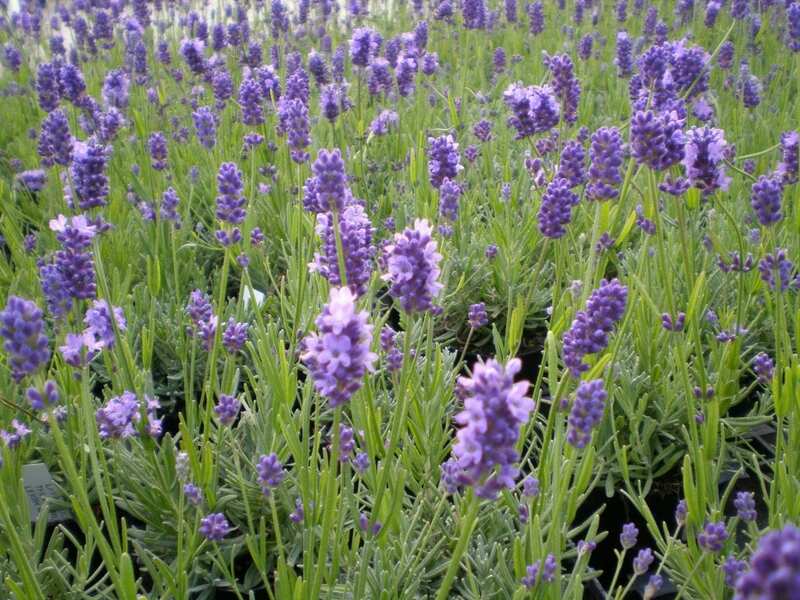 The two main groups (ignoring tender and tufted varieties) of lavender are Lavandula Angustifolia and Lavandula Intermedia. For a good dark purple-blue bunch, choose Angustifolia varieties (pic below), which tend to be smallish, giving stems of 20-30cm. Intermedia varieties usually give greyer but bigger plants (pic above), with longer stems 30-50cm. You can see from the photo above that the calyxes of this variety of Angustifolia have a good purple all the way down the flower. 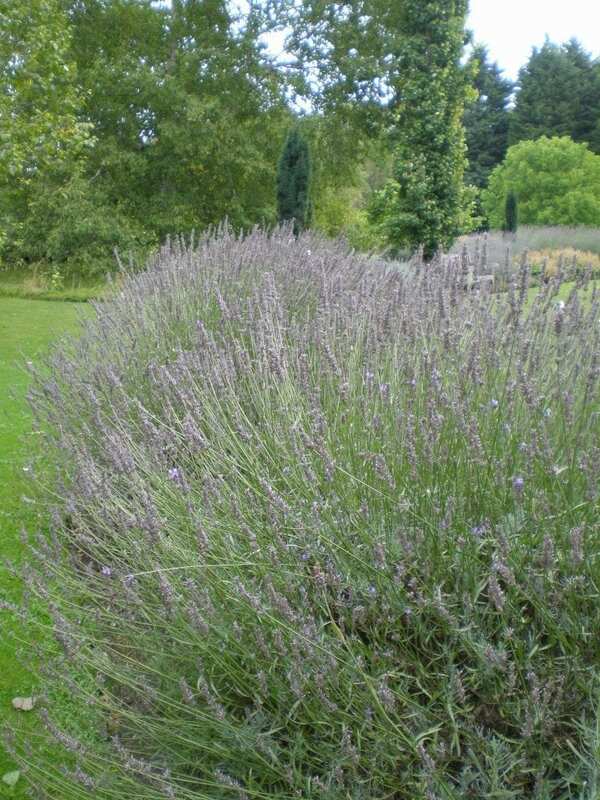 Plants of Intermedia can be very useful in the garden for providing a big impact, as shown in the photo below (taken at Cambridge University Botanic Garden), and what the dried flowers lack in colour is made up by size, and a strong lavender fragrance even when dried. The two photos below show the difference in colour between the two varieties when dried. The photos show the best colour achieved by commercial growers and dryers. The photo below shows a variety of Intermedia, and the bottom one is a much darker Angustifolia. More on how to dry the lavender in a later post. The bunch of Angustifolia above is a variety called “Imperial Gem”, which has a beautiful deep colour and a good fragrance too. Incidentally, I am often asked about white dried lavender, but although the florets of this plant are white, the calyxes are grey-green, so will result in a grey-green dried flower unfortunately. If you can’t or don’t wish to dry your own bunches, they are readily available online.